Crispy sesame tofu with zucchini noodles is the perfect healthy, vegetarian meal prep that is low carb, vegan and gluten free too. 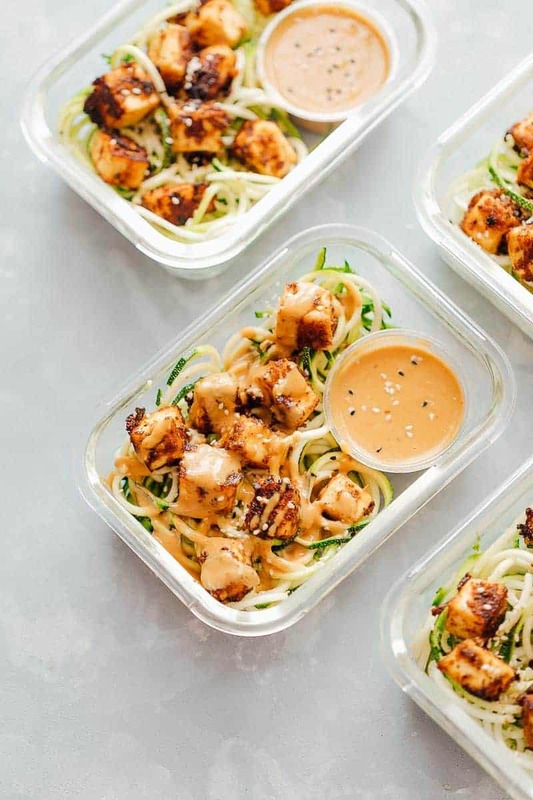 These meal prep lunches are served with crispy sesame tofu on a bed of zucchini noodles and a delicious peanut sauce to go with! It’s the absolute beginning of the New Year and I’m ready to tackle 2018. 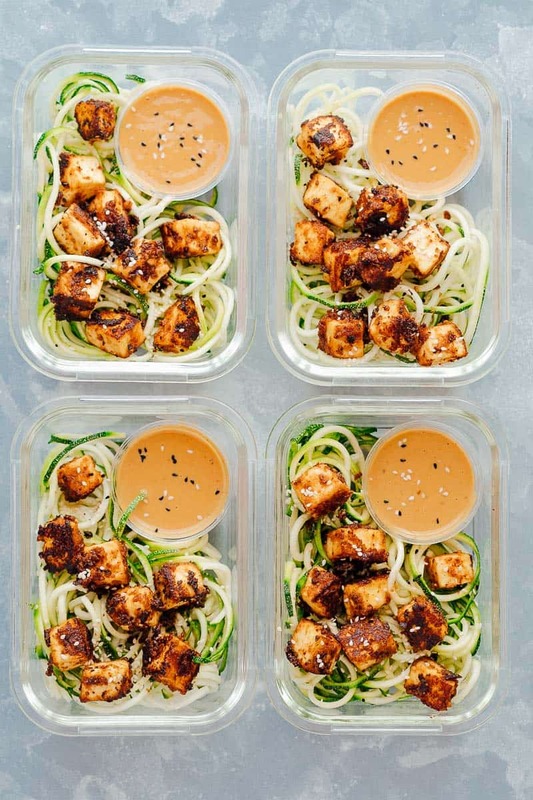 Actually, I’m ready to tackle anything with these super YUM and crispy sesame tofu with zucchini noodle meal prep lunches. I made these last week and the week before and I’m still making them. I know how that sounds. I can almost hear you say – you need a life woman!! But these are soooo good, that I really can’t stop. And I feel light and healthy and there are no post lunch nap times. Because that’s my biggest problem in life. How to work from home and not fall asleep as soon a slunch hits my stomach. I’ve tried tea, coffee, getting up and walking around but nothing works. Except a light, healthy lunch. As long as I don’t feel super full and heavy after a lunch meal, I’m ready to power on. And that’s why these crispy sesame tofu with zucchini noodle meal prep lunches are so very amazing. I love recipes like these which are minimal effort. And that’s all there is to it! 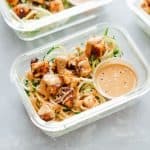 You just place the peanut sesame sauce in disposable sauce cups like these; add the zucchini noodles to glass meal prep containers and you are good to go!! I have to tell you that this is a really light meal. So it’s more like a nice salad that adds fiber, protein and fats to your lunch. Or you can pour the sauce over the tofu and microwave the meal prep container. Toss everything and it’s a delicious hot meal. The zucchini noodles do leave a little water when you microwave, and when you toss everything together, it gets a little soupy but still stays crunchy and delicious. These meals stay good in the fridge for five days. I like storing the sauce separately so that the zoodles stay fresh and crunchy till you are ready to eat. The salts in the sauce will make the zoodles leave water so best to store it separately. Make the Sauce: In a blender or food processor, add all the ingredients for the sauce along with a splash of water and blend till smooth. Set aside 1/4 cup sauce and divide the rest in the mini sauce containers. You might be left with a little extra sauce which you can reserve for later – it works really well as a salad dressing! 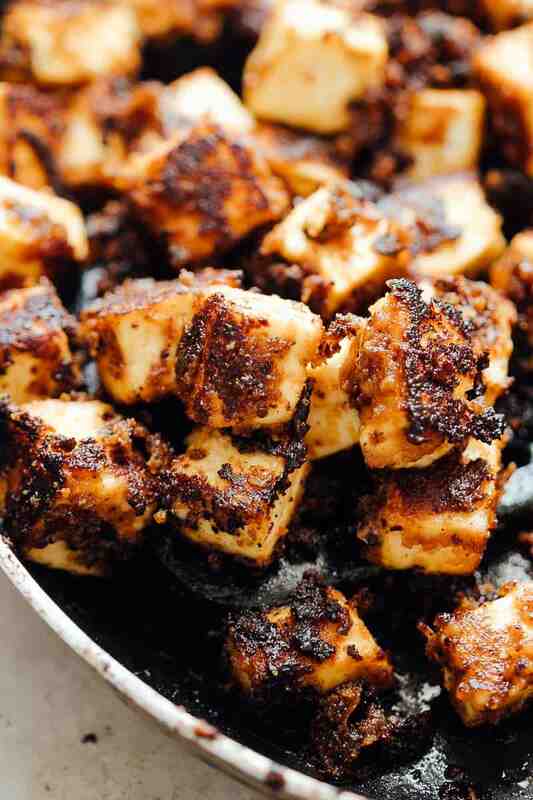 Cook the crispy tofu: Heat oil in a pan and add the tofu. As soon as the tofu is a very light brown, add 1/4 cup sauce to the pan and toss the tofu in it. Cook everything on low heat. In some time, the sauce will start to evaporate and slowly it will start turning into golden brown and sticking to the pan and tofu. Things will become crispy and you finally you’ll be left with crispy browned bits of tofu in the pan. Assemble: To assemble the meal prep containers, divide zucchini noodles in the containers. Divide the tofu amongst the containers and place the mini sauce containers on one side. Place the lid and refrigerate for up to 5 days. 3. You can easily swap the zoodles for noodles if you like because these taste great both ways! Hi, would you also happened to have the calories per serving, as I’m on a diet right now.? I was so excited about this recipe. But it just didn’t work for me. It definitely took way longer than 30 minutes and my tofu never got crispy. The tofu was in the pan for a solid 20 minutes before even adding the sauce, sizzling away, but it never got brown. So then I added the sauce, and it did evaporate, but it never stuck to the tofu and the tofu never got crispy or coated. It still kind of tastes like nothing, and I love tofu. I still give the recipe 3 stars because this sauce is my new favorite thing. You could put it on an old shoe and I would asks for seconds. Hey Tara, I’m really surprised that this didn’t work for you. I have so many readers who have tried this recipe and left a comment on the blog as well as Instagram with great results. I have a few questions which will help me troubleshoot: Was your pan hot enough when you cooked the tofu? Did you make any changes to the quantity of sauce/ ingredients/ quantity of tofu? WOW! I’ve never left a comment on a recipe before but I am beyond happy I came across this one. My taste buds are thankful! So so yummy! Yaaaay! Glad you liked it Sarah! Can we not use maple syrup? Will it change the taste? Was wondering if we could opt the maple syrup out as we do not like sweet food? Will it change the taste or texture of the tofu? First time I have cooked with tofu. Had it hot with soba noodles cooked in remaining sauce I loved it and my husband was checking we had enough ingredients to do it again! Haha you are the best. Thanks Karen! Is there another sauce that I could use if I am allergic to peanuts? Hey Danielle, you can substitute peanuts for tahini which is a sesame paste. It tastes fabulous! I could eat this peanut sauce by itself with a spoon it’s so good. What type of spiralizer do you recommend? Hey Kelly, that peanut sauce is so amazing! I’m always licking the back of the spoon when I’m done making it. I have a paderno spiralizer but I’ve really good things about the inspiralizer too. This looks so great!!! Does the tofu stay crispy throughout the week? I don’t usually comment on recipes – but this was so good, I just had to! I just made it and it was delicious. I sautéed the zucchini a tiny bit. I’m new to cooking with tofu and this was easy to follow. I’m going to hang on to this one for when we have company! How many zucchinis do you use in this recipe? I used two large zucchinis which was enough for us. Hey Jue, the sauce should have the consistency of thin cream. It is definitely pourable consistency. You can adjust the amount of water to your taste. Hi, I’m very new to tofu cooking and this sounds amazing. Do you press the tofu first for this? Is that just something that is a given when cooking with tofu? Some recipes call for it and others don’t. Hey Stephanie! I didn’t press tofu because I’ve used firm tofu, which doesn’t need to be pressed. I’ve just started to cook with tofu, do you have tips on how to prep it so it doesn’t stick to the pan while cooking? Hey Jessica, I usually use a non stick pan while cooking tofu and it never sticks. can you please tell us know to make the zuccini noodles?? Is that only zuccini or is there some noodles as well added. sorry if this seems like a silly question. Hey Diya – no question is stupid. 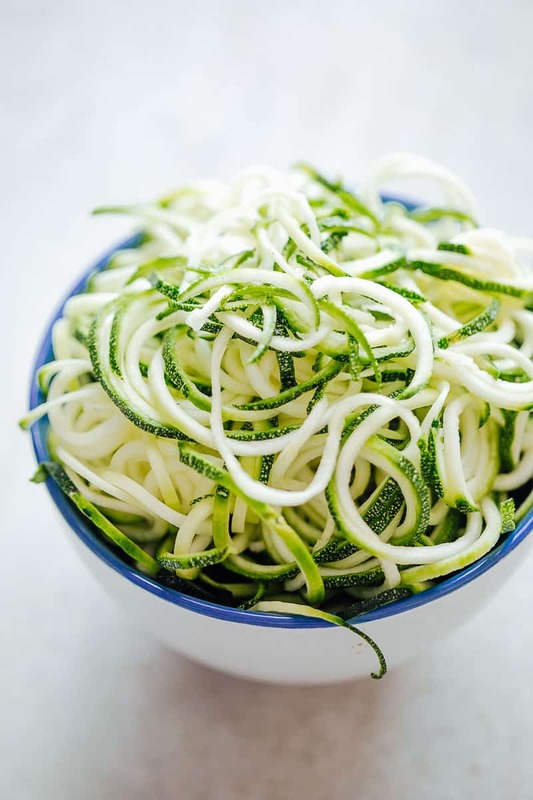 Yes its only Zucchini which is spiralized into noodles using a spiralizer. You can use a peeler and just peel the whole zucchini into ribbons or use regular noodles if you like. Just made it! SOOOOO good! Thank you so much for sharing this!! Soo glad you liked it Tara! These will be perfect for a clean start of the new year! Love them! Wow, that crispy tofu looks amazing!! What a nice, healthy lunch!